Greg writes: "Curiouser and Curiouser" wrote Lewis Carroll, and Greg writes the same thing again. 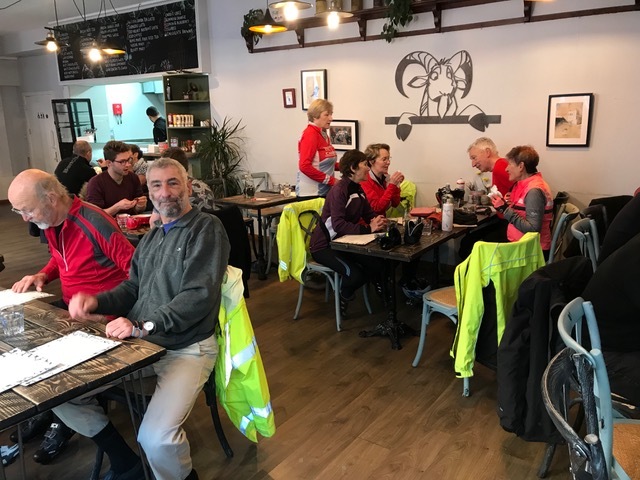 Today's ride was to a new venue – The Curious Goat in Saffron Walden – and it was a trip with some Wonderland moments and Curious Goings On! There was a brief pause as Sue told us that we couldn't start until she had "Got Dressed". This necessitated a heave or two on some sagging leggings – something to do with the tumble dryer and the elastic not hitting it off. So, having hitched herself up and with Greg having finally persuaded Averil and Adrian to arise from the bench we set off. Liz was along again as were Mick and Mike K.
We picked up the busway and headed off down the DNA path to Shelford. We took the Whittlesford Road – and were sailing along very nicely in glorious sunshine, a temperature of 11C – and just outside Whittlesford we collected Phil. After crossing the "505" we left Duxford via the back route to Hinxton. Sue missed the path for the bridge and Mark wisely advised her against trying her luck on the ford. Mark then told us of Lalli's adventures here – where she tried out the ford only to discover how weedy and slippery it was. Having had a thorough dunking she then picked herself up and continued on her way – to a meeting at the Sanger Institute. I am sure the audience found her (damp) presence highly memorable... So, although Lalli couldn't make the ride in person as she was in Brussels – her spirit was with us as we talked about her! After Hinxton we headed towards Ickleton – only to be held at the level crossing. After some five or so minutes – with no train in sight – Greg decided to take matters into his own hands. "Look, if I deglove and root around in my saddlebag I can find my phone and take a picture. The action of trying to uncover my phone is bound to make the train come..." And lo, it came to pass that this is precisely what occurred – Greg magicked the train up and then the gates rose. We headed off once more. Soon Coploe Hill came into sight and we started on the first proper hill of the day. At the top in the lay-by was Dave W and as we waited for everyone to regroup he joined us for the remainder of the ride. Sue ascended the hill and stopped – an urgent need to hitch her strides up once again was duly satisfied and we were off again. Just before the top of the next hill where it gets into Catmere End, across the field, was a herd of deer enjoying the autumn sunlight and they were clearly picked out against the tree line – an added bonus. So we swept downhill towards Saffron Walden. We crossed the main road and cycled down over the bridge – looking left across the sunlit vista to Audley End House – surely one of the finest views in England! After that it was up the hill and then down again into Saffron Walden town centre. Greg led the group up Cross Street to the new stop – the Curious Goat. Whilst there was no real bike parking facilities outside we made do with various walls, lampposts etc. and duly took up the two tables they had reserved for us. The café is somewhat upmarket compared to our usual venues – with a rather appealing menu of snacks, open sandwiches etc. The waiter took our order (wearing, it must be said, the finest pair of platform shoes since The Bay City Rollers were in their prime). The coffee was very good – and Sue declared the Blueberry Cake among the best cakes she had ever had – praise indeed! The piped music was somewhat of a distraction and whilst they could accommodate the twelve of us we would definitely overwhelm it on a Thursday ride. All in all, a worthwhile experiment to try somewhere new. Recommended as a lunch/café if anyone is out in Saffron Walden but not exactly on the club wavelength. Still, time was marching on and, after Sue had hitched herself back up again we proceeded to leave. The temperature had fallen a little as we left the town centre – taking a route up Gold Hill which showed some of the finest architectural treasures of Saffron Walden and was somewhere Phil had never been – we aim to please! At the top of the hill a light rain flurry started – Susan was horrified that the weather gods had the temerity to rain on "Greg's Ride" but I advised that she should relax – the rain had been by special request so that I could lay on a rainbow for the attendees and it would ensure the wind dropped after the front passed through, as promised! Whilst the rainbow duly appeared, as we swept downhill the rain got somewhat more intensive. 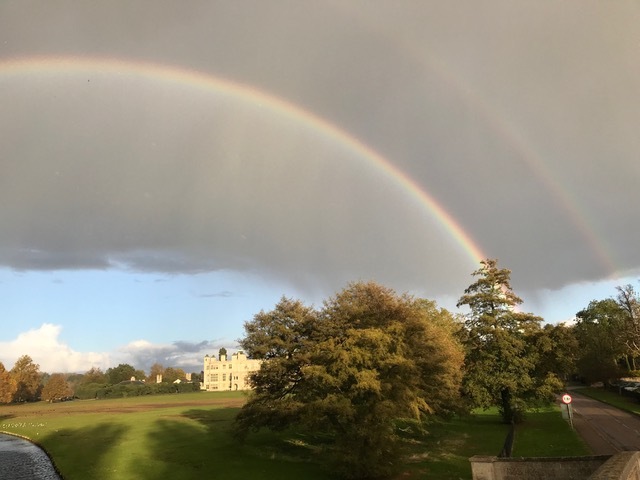 At the bottom of the hill we were rewarded with a frankly stunning vision – a clear double rainbow over Audley End House. This was clearly a Wonderland moment! As we headed back up hill towards Catmere End it was noted that both the temperature and the wind had dropped – ah, so Greg's prediction did come true! The rain squall soon passed and once more at the forest margin were the deer enjoying the fading moments of sunshine. 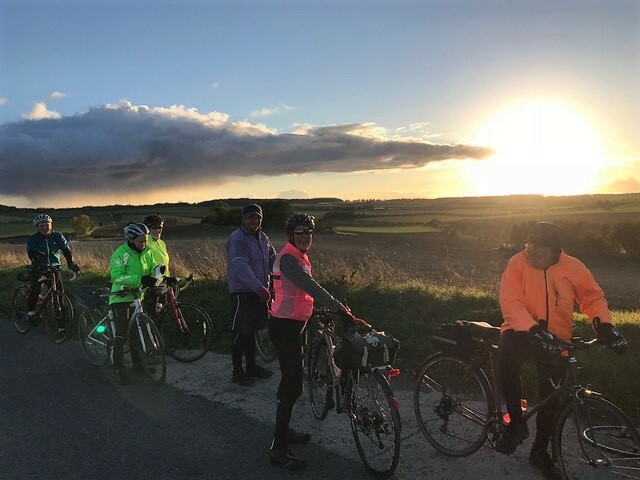 On arriving the top of Coploe Hill once more we rested and looked at the stunning sky – the rain clouds were long past and the setting sun was giving Adrian a halo – we were indeed blessed by his presence on the ride, as ever! So we headed to Duxford where Sue and Phil peeled off, we dropped Dave W. at Newton and Susan at Hauxton. The Blessed Adrian left with Averil and Liz to head back to town via Grantchesteer and the remainder headed back via the busway. For the Curious the ride stats were that the total trip was some 38 miles at an average speed of just over 12 mph. and a temperature that started out at 11C and ended at 4C. But we did have moments of Wonderland – rainbows, halos and deer – a memorable adventure all round!